Pakistan International Airlines (PIA) is the national flight carrier of Pakistan and the airline company started operations in the year 1946 with the name of Orient Airways. With primary hubs at Jinnah International Airport, Islamabad International Airport and Allama Iqbal International Airpor, PIA operates scheduled flight services to over 73 destinations across Asia, Middle East, Europe and North America. PIA currently employs more than 19000 staff. PIA has code-share agreements with Aerosvit Airlines, China Southern Airlines, Thai Airways International and Turkish Airlines. PIA's total passenger fleet 42 aircraft include aircraft models such as Airbus A310-300, Airbus A320-200, ATR 42-500, Boeing 737-300, Boeing 747-200 Combi, Boeing 747-300, Boeing 777-200ER, Boeing 777-200LR and Boeing 777-300ER. The name for PIA's frequent flyer program is "PIA Awards Plus" which allows its participating members to enjoy extra benefits such as free tickets, excess baggage vouchers, cabin upgrades and also entitled to other various rewards and special deals. There are a total of 3 tiers in the membership program - Emerald, Sapphire and Diamond. With response to the demanding need of extra flight services during the Muslim Hajj season, PIA operates a special two-month Hajj operation every year. This flight route from Pakistan lands in Jeddah in Saudi Arabia. 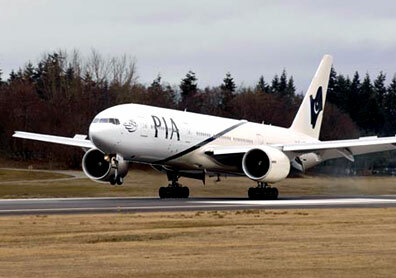 Each single year, PIA can handle as many as 90,000 pilgrims each year. The flights originated from either Karachi, Lahore, Islamabad, Peshawar, Quetta, Faisalabad, Multan or Sukkur and all of them flies to the Kingdom of Saudi Arabia. Pakistan International Airlines Flight Routes - Map Showing all flight routes taken by PIA worldwide. Check flight schedule, flight status directly from Pakistan International Airlines official website. You can also check on the cheapest airfare, flight schedule, flight status, airlines offices, contact number, airlines packages, air cargo partners, air ticket prices and booking procedure, international airfares, frequent flyer and other flight information and travel deals and packages. When you are making an airfare booking, select from either economy airfares, business class airfares or first class airfares whichever you prefer. Have a pleasant flight journey and enjoy your holidays or business trip!